Delilah is named for a line in the Bob Dylan song, Tombstone Blues. 'Tears from Laughter' was all too appropriate for the puppy who made me laugh so hard I cried. Delilah's song: Bob Dylan - "Tombstone Blues"
Delilah is an exuberant and enthusiastic youngster showing loads of promise in everything she does. While still a wee pup running about with her litter-mates, Delilah made it pretty clear that she would be the one who stayed here - she was too full of mischief to pawn off. Not to mention the fact that she reminded me so much of her mum. She is never one to be left out of the fun or ignored, and is often the ring-leader of great doggie adventures on the farm. From the minute she wakes in the morning until she retires for the night, Delilah is a dog with an agenda. When she senses a game about the begin, Delilah springs straight up in the air with all four paws to kiss my nose, fortunately with enough finesse to avoid collision. Despite her enthusiastic love of work and play, Delilah is a supremely sweet and livable house dog. Sociable and friendly to all, Delilah enjoys making new friends, human and canine alike, and is adaptable to any situation, earning her a premier co-pilot position. She loves water and is an avid retriever (albeit a bit obsessive), often seen carrying a vast collection of toys in her mouth. 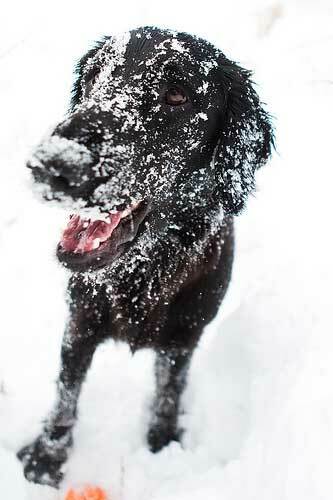 A natural comedian and entertainer, Delilah’s antics never fail to make me smile. A personal favorite is her flying leaps over the back of the couch to be the first in my lap. Despite her abundance of enthusiasum and penchant for airborne antics, Delilah is surprisingly eager to please. She is a thoughtful dog and one smart cookie. Delilah is sensitive, though responsive to pressure. In the field, Delilah is a fantastic natural marker, holding lines over distance and through obstacles, and processing complex marking concepts. 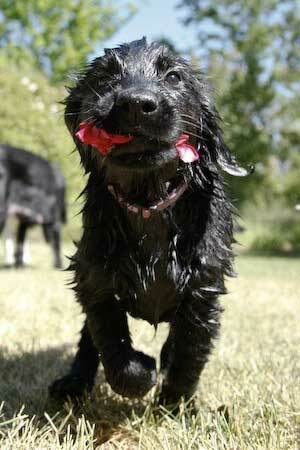 She is a bold and fearless water dog. She earned her first JH leg at the tender age of 8 months, and completed her title soonafter. 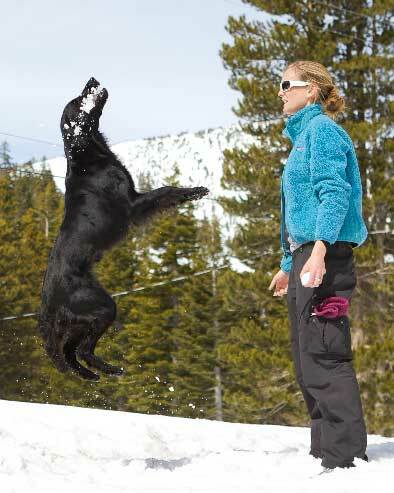 At the 2010 Flatcoat National Specialty, Delilah earned her WC with ease and won Unsteady Singles! 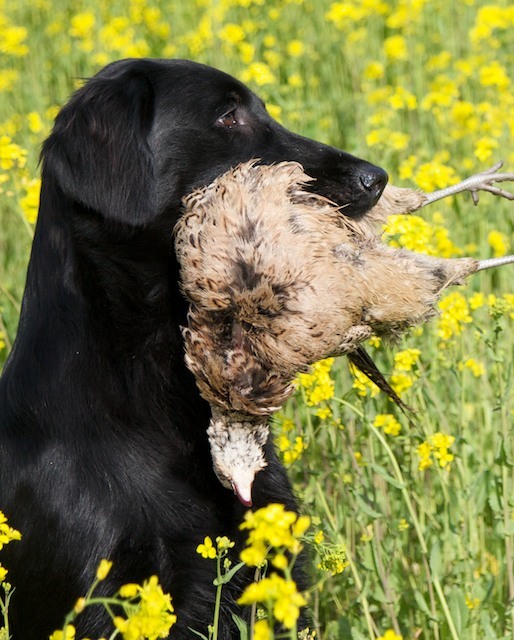 Delilah took time off from the hunt test game to raise her litters and fulfill her hunting partner duties but returned with a bang at the 2012 Specialty, JAMming Steady Singles, earning a Senior Hunter leg and a WCX. We hope to finish her SH and embark on her Master career in the upcoming year, but only so far as it doesn't conflict with her busy hunting schedule. While an exceptionally birdy dog, Delilah maintains a collected working attitude even when overwhelmed with excitement. In her first shooting season at under a year of age, Delilah already revealed herself as a more than capable worker in the pheasant field. 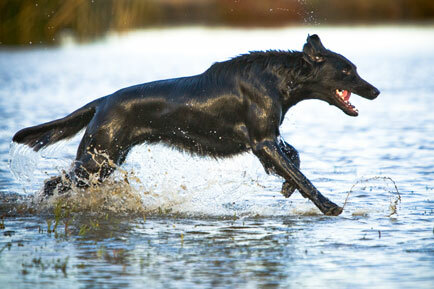 She is both a determined and methodical game-finder, and a reliable and soft-mouthed retriever. 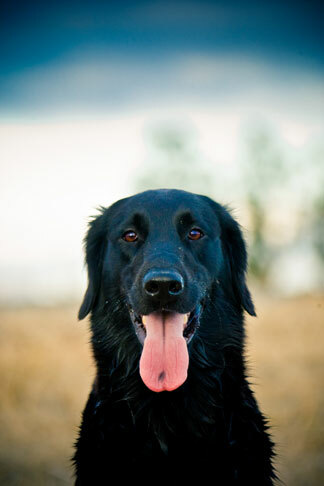 Delilah is a close-working dog with a naturally methodical quartering pattern. She is loaded with stamina, perseverance, and fearlessness. 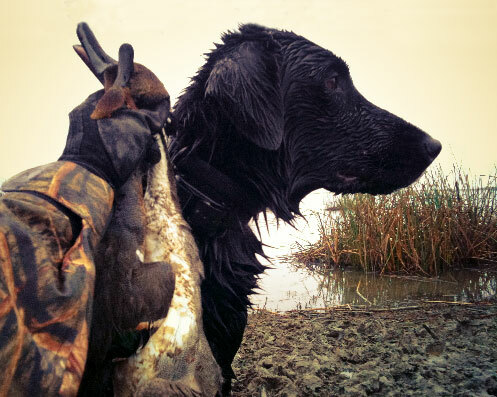 Delilah immediately proved her worth as an duck dog. 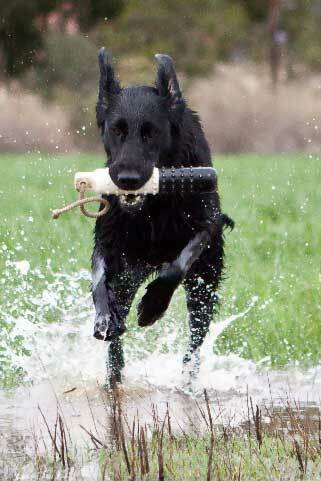 Calm in the blind with her eyes on the sky, and explosive and reliable when sent for a retrieve. While full of courageous independence on the retrieve, she is quickly learning to take casts when the situation warrants. I look forward to many fun hunts ahead with this special spitfire of a gundog. 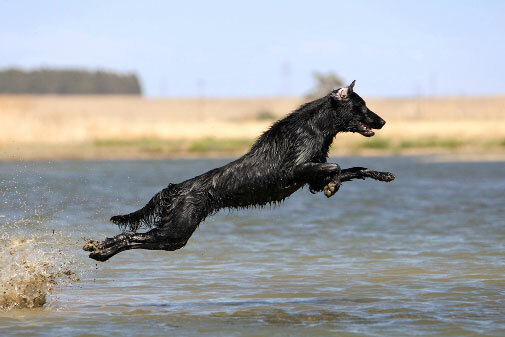 Delilah is a very powerful and athletic dog, sporting a feminine and racey build. With angulation complementing her length of loin, she can really boogie under herself with nice reach and drive, and is a clean and balanced mover. She has a strong front paired with excellent length of neck transitioning to a level topline with a slight drop at the croup. Though her head is feminine and refined, she could use the slightest touch more fill and darker eye to call it perfect. She has an especially beautiful coat, glossy and flat-lying. While Delilah finds the dog show game a bit of a bore, she tolerated them long enough to earn her Championship with 3 major wins. Delilah's pups share her sound structure and temperament, adaptable nature, superb water attitude, and keen sense of adventure. We're also pleased to see her trainability and excellent hunting instincts inherited.